You are here: Home / Articles / Could fracking finally kill off rural America? 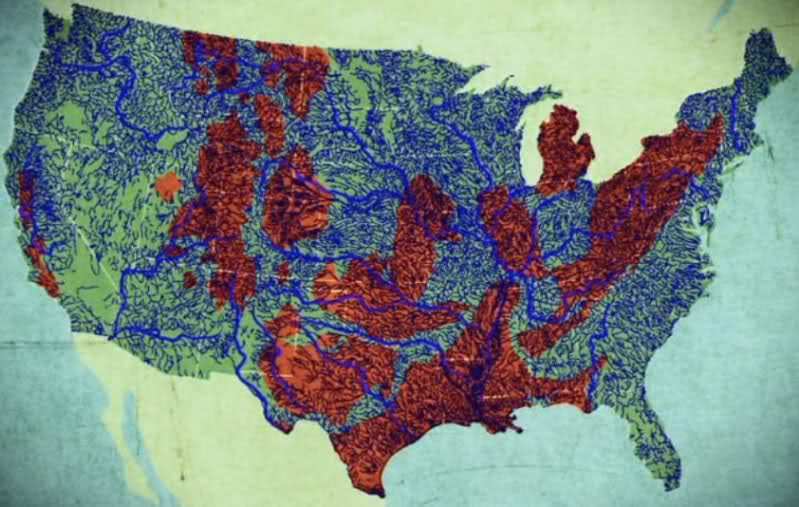 U.S. map showing waterways (in blue) over shale gas plays (in red). Photo: Gasland 2. It’s not just Detroit that has gone bankrupt. Today, urban industrialism looksmore ready than ever to collapse under the weight of its own staggering financial, ecological and spiritual debt. By contaminating water supplies from sea to shining sea, the industry’s final desperate gambit to keep the fossil fuel party going for a few more years could render much of rural America uninhabitable. As despoiled rural communities shut down, families will have no choice but to seek housing and work in the city. And the cruel joke at the end of it all is that natural gas may turn out to be a bubble, with fracking ruining millions of acres of perfectly good land for only a few years of gas supply. The wells may run dry in five or ten years, but the pollution will remain for decades. Meanwhile, urban escapees will have to forget their dreams of moving to a rural area, buying a little farm and building a self-sufficient homestead. If fracking renders large areas of countryside unfit for sustainable farming, not to mention plain old human habitation, disaffected downtown office workers may little choice but to stay in their cubicles, shut up and do their work — at least until the next round of layoffs. But don’t think the Obama Administration, which touts natural gas as a clean fuel that will help reduce climate emissions, is just sitting around waiting for other nations to get into fracking. Fortunately for top U.S. gas drillers such as ExxonMobil, Chesapeake Energy and Anadarko, the administration has recruited the U.S. taxpayer to help pry open reluctant markets like Poland and India through the State Department’s Global Shale Gas Initiative (now known as theUnconventional Gas Technical Engagement Program). Erik Curren is the publisher of Transition Voice. He co-founded Transition Staunton Augusta in 2009 and serves as managing partner of Curren Media Group. In 2012, Erik was elected to the city council of Staunton, Virginia. I wish the site was more trafficked but think that your comment regarding those who do come here an unnecessary one to say the least. One visit and you feel entitled to judge seems unlikely to make a good impression. If I were judgmental, for example, I might say your entire thrust is to advertize your own business rather than comment on political threads. But, fortunately, I am not that willing to judge others so quickly. I should have caught and rejected “Mr Orlando’s” comment as SPAM before it ever got posted. I get several dozen of these bogus comments every week. It was just an oversight that I missed this one. I have rejected it after-the-fact (which is why it’s gone), Otherwise any new comments he posts may get accepted automatically without my oversight. That’s due to the policy I’ve elected to apply to comments (review first one by a user, automatically permit all subsequent comments by the same user). The IP address from which he sent his comment is located in Jakarta, Indonesia (!) although his business URL translates to an IP address in Orlando, Fla. He is probably using a spam service in Jakarta. I’ve also added his spam IP address to my permanent ban list. So he shouldn’t be able to post any more comments. No apology necessary, running a website cannot be easy. This sort of parasitic occurrence happens on many fora and is difficult to exclude I am sure. I would only add that , as resident of Northern California I welcomed finding this website and do hope it grows and becomes a vibrant source of political exchange.